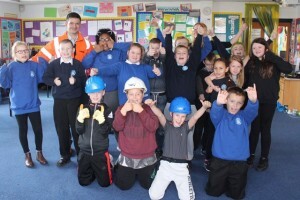 Network Rail has provided hundreds of primary school children with access to railway safety workshops to coincide with a series of level crossing closures and upgrades in East and Central Scotland. The aim of the workshops, hosted by children’s drama specialists, is to give children confidence when using the railway and to educate them about the potential risks of trespassing and playing near the line. So far over 400 pupils from seven schools have participated in the Stirling, Edinburgh and West Lothian areas. The schools involved are Braehead Primary School, Bridge of Allan Primary School and Cornton Primary School in Stirling, Longstone Primary School, Canal View Primary School and Redhall School in Edinburgh and Kirknewton Primary School in West Lothian. The workshops are focussed on locations where Network Rail has identified crossings for significant upgrades or closures.In Edinburgh, Kingsknowe level crossing will be upgraded this Christmas to a full barrier crossing. In Stirling, St Ninian’s level crossing will be replaced by a footbridge while two crossings in the Cornton area are earmarked for closure. “The workshops have been specifically designed by a children’s drama specialist to encourage learning through play. The initiative helps us to discourage trespass while encouraging responsible use of the railway. “The most important aspect of these workshops is that pupils are, in the main, learning from their peers. Their collective knowledge is excellent and encouraging them to share their thoughts and experiences is an extremely positive, memorable method of teaching. The children have been full of energy, ideas and enthusiasm throughout and the feedback from pupils and teachers has been very positive.